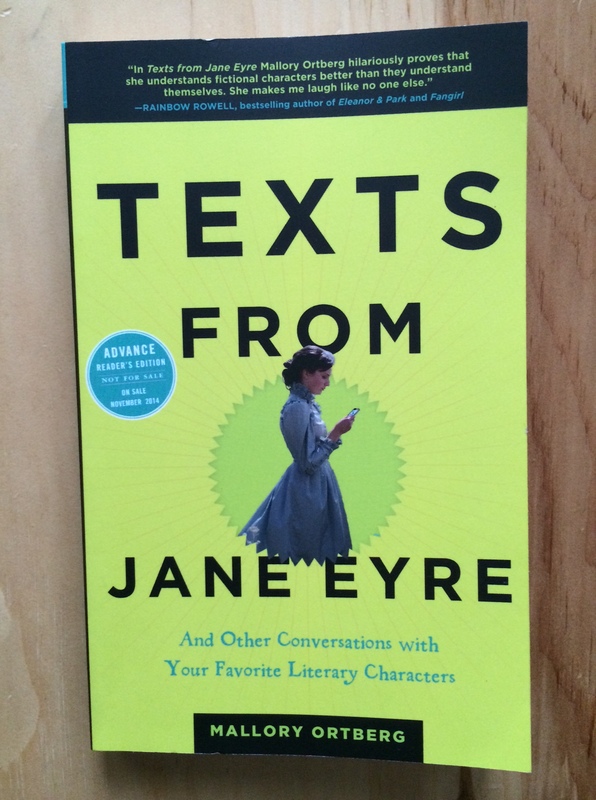 When Mallory Ortberg’s Texts from Jane Eyre* arrived, I tried to put off reading it because I knew I wouldn’t want to stop. In text message vignettes, Mallory Ortberg skewers everything from Medea to The Hunger Games, and everyone from Thoreau to Cormac McCarthy. Imagine Hamlet as a petulant teenager, Mr. Rochester as that guy who texts in all caps, and Ashley fending off sexts from Scarlett O’Hara. I’ve been trying to find a section to excerpt, but I just can’t because I want you to enjoy this book in its entirety. I will say that I started crying with laughter when I read the words “pocket witch.” I bet you will too. This book is so, so very funny. It’s so funny I called my parents just to read them excerpts. It’s so funny I woke up my son because I was laughing so hard. If you spend any of your free time reading book blogs (thank you! ), I think you’re going to love it. If you like Mallory Ortberg’s work on The Toast (which, by the way, just published an amazing essay by Katie, whom I’m proud to call a friend), you probably already know how much fun you’re in for. If you’re an English teacher, run out and get it. I can’t stop wishing it had been published when I was teaching Shakespeare or drama or Modern lit because it would have been like dessert after every book or play we read. Okay, to review: This book. Very funny. You should read it if you like laughing. Ah, I seriously can’t wait to read this!! Thank you for all of your book reviews. I can’t wait to read this one–putting it on my Goodreads list right now! ~Thank the person who nominated you for the award. ~Add the One Lovely Blog logo to your post. ~Share 7 facts/or things about yourself. ~Nominate about 15 bloggers you admire and inform nominees by commenting on their blog. I can’t wait to read more about what you’re reading! Be well. I want this for Christmas so badly.